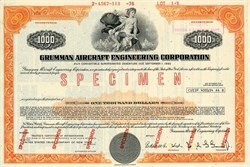 Beautiful engraved RARE specimen certificate from the Grumman Aircraft Engineering Corporation printed in 1969. 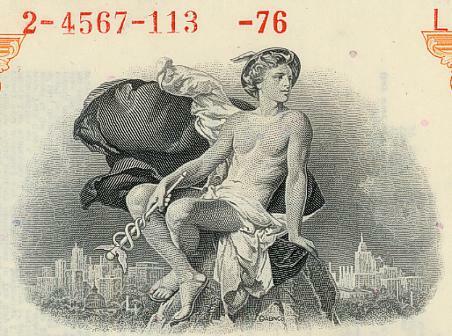 This historic document was printed by American Banknote Company and has an ornate border around it with a vignette of Mercury. This item has the printed signatures of the Company's President and Secretary and is over 46 years old. The Grumman Aircraft Engineering Corporation, later Grumman Aerospace Corporation, was a leading producer of military and civilian aircraft of the 20th century. Founded in 1929 by Leroy Grumman with Jake Swirbul, its independent existence ended in a 1994 merger with the Northrop Corporation to form Northrop Grumman. Leroy Grumman and others worked for the Loening Aircraft Engineering Corporation in the 1920s, but when it was bought by Keystone Aircraft Corporation and the operations moved from New York City to Pennsylvania, Grumman and his partners (Edmund Ward Poor, William Schwendler, Jake Swirbul, and Clint Towl) started their own company in an old Cox-Klemin Aircraft Co. factory in Baldwin on Long Island, NY. The company filed as a business on 5 December 1929, and opened its doors 2 January 1930. Keeping busy by welding aluminum tubing for truck frames, the company eagerly pursued contracts with the US Navy. Grumman designed the first practical floats with a retractable landing gear for the Navy, and this launched Grumman into the aviation market. The first Grumman aircraft was also for the Navy, the Grumman FF-1, a biplane with retractable landing gear. This was followed by a number of other successful designs. As the company grew, it moved to Valley Stream, New York, then Farmingdale, New York, finally ending up at Bethpage, New York, all located on Long Island as well. For much of the Cold War period Grumman was the largest single corporate employer on Long Island. Grumman's products were considered so reliable and ruggedly built that the company was often referred to as the "Grumman Iron Works." During World War II, Grumman became famous for its Navy fighter aircraft, F4F Wildcat and F6F Hellcat, and for its torpedo bomber TBF Avenger. Grumman's first jet plane, the F9F Panther, became operational in 1949, but the company's big postwar successes came in the 1960s with the A-6 Intruder and in the 1970s with the F-14 Tomcat. Grumman were also the chief contractor on the Apollo Lunar Module that landed men on the moon. They received the contract on 7 November, 1962, and ultimately built 13 lunar modules (LMs). As the Apollo program neared its end, Grumman was one of the chief competitors for the contract to design and build the Space Shuttle, but lost to Rockwell International. Meanwhile, in 1969, the company changed its name to Grumman Aerospace Corporation, and in 1978 it sold the Grumman-American Division to Gulfstream Aerospace. The end of the Cold War at the beginning of the 1990s and the ensuing reduced need for defense spending led to a wave of mergers as aerospace companies shrank; in 1994 Grumman merged with Northrop to form Northrop Grumman.